1. 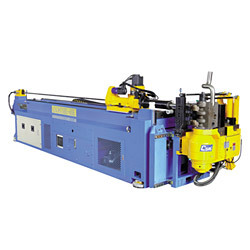 Advanced machine models with patented RBE (rear booster electrics-driven) function are specially developed for higher grade (tight radius or heavy duty) tube bending. 2. The powerful boost device with automatic clutch is designed to mount on the carriage (feeding axis) of machine. So that the machine could easily perform difficult tube bending under critical terms such as thin wall, tight radius or restricted standard to wall thinning and ovality. 3. This function is available on machine models such as CNC65TBRE-RBE, CNC80TBRE-RBE, CNC100TBRE-RBE, etc. 1. Max. bending capacity OD * WT: 80x2.5mm. 2. Useful mandrel length: 3000mm.